Nothing much to add today as the market spent the day within a tight range. 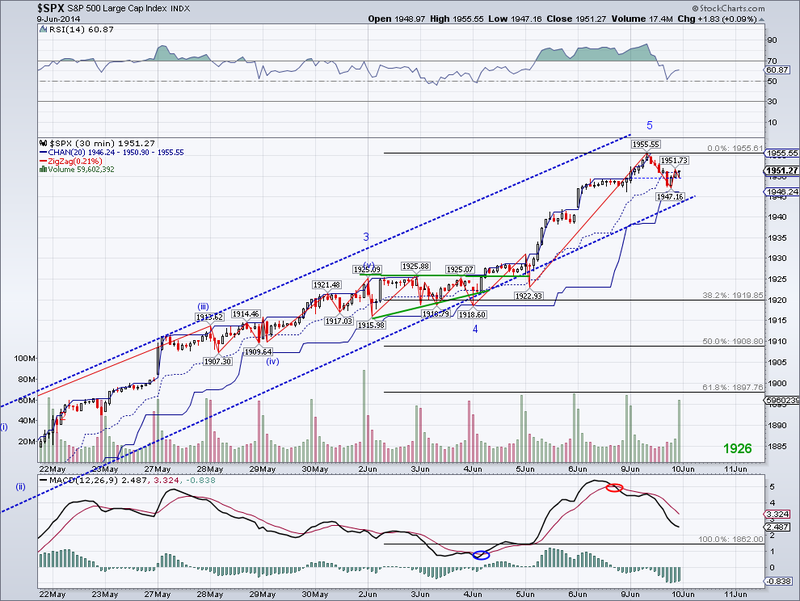 The count I posted is still in play but perhaps the W3 is going to extend since there's a bullish nested 1-2 pattern. The 30 min MACD is rolling over and that's normally a signal for a short term bearish wave coming, so a bullish wave has to come tomorrow or else the market will be going back to test support again. Maybe a big move will come after the World Cup is over, for now watching soccer is a lot more interesting to me than looking at waves. And speaking of which, the ideal match I mentioned weeks ago looks very possible and that is Argentina vs Brazil, which Argentina will likely win imo. The market tested the Trend Average again today and bounced back at the end of the day to end in positive territory. Considering today's price action, I am labeling the bearish wave from yesterday a C. And if the bounce wave from 1944 is a W1 of a bullish 5 count, then I have 1975-80 as a target for this new bullish wave. So it looks likely that we will see another all time high next week if the mood stays the same. Looks like SP2000 is around the corner.. The bearish wave materialized today and it didn't even get to 1941 before bouncing and recouping most of the losses and closing comfortably above the Trend Average. This pattern could be part of a bearish nested 1-2 with further downside to come, but I am leaning towards the wave being a C wave since the TA hasn't been affected at all during this correction. Alternatively, this could also turn into a double Zig Zag with lower lows but the bottom line is the market looks like it will make another attempt at new all time highs. I ended up selling my volatility position at the break of the TA on the counter rally and now I am just holding oil. Maybe the market is expecting QE4 in 2015, like a baby is expecting his mom to feed him. So maybe the horrible GDP numbers or perhaps even a recession is what the market needs to go up another 30%! 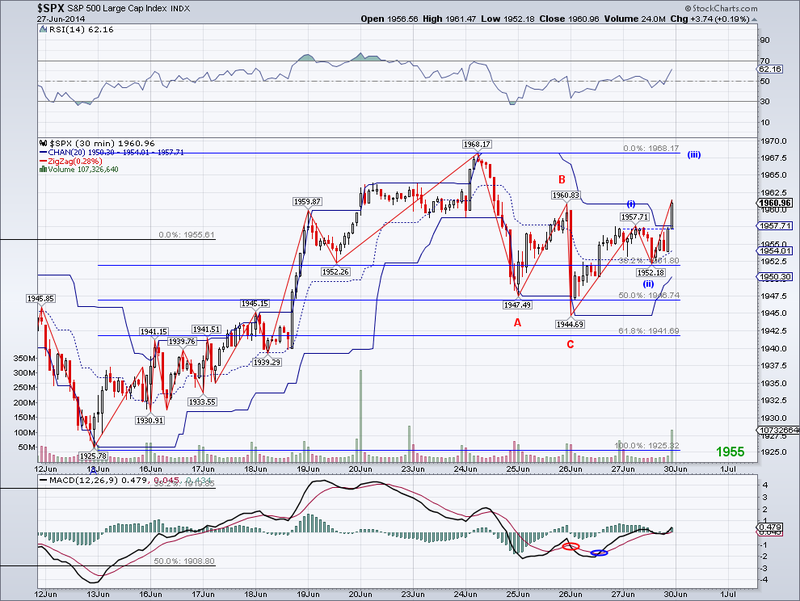 The SP500 bounced as expected after completing a bearish 5 wave micro count but it fell a bit short of its target. Still, this bearish wave could be the start of something bigger but obviously it needs to be confirmed with the next bearish waves and a the loss of the Trend Average. 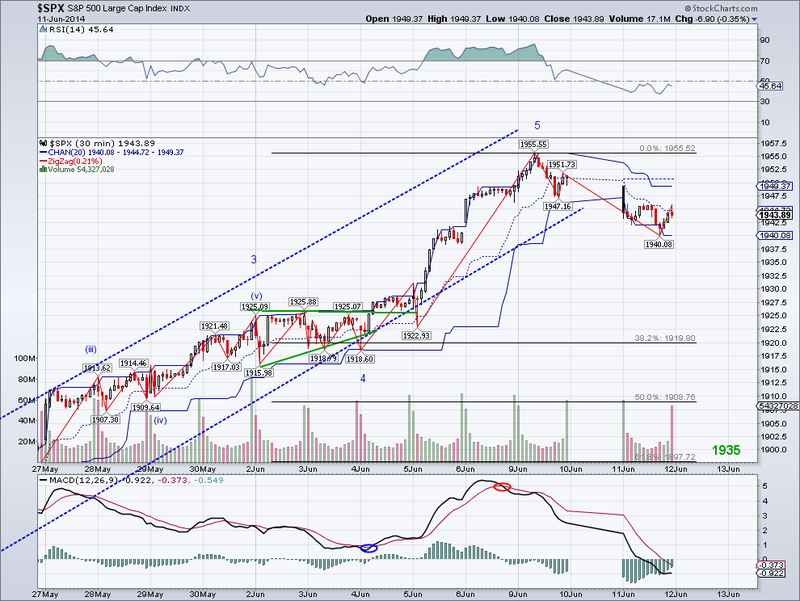 For now, I'd like to see how the next bearish wave handles the 1941 support area. The market could continue to bounce tomorrow but the next bearish wave should start soon and give us an idea of whether it is a C or a W3. The revised GDP growth numbers were very bad at -2.9% for the first Quarter. The economy would have to grow 3% this Quarter just to bring economic growth to 0%. The economy will need to grow 4% in 3rd and 4th Q to meet the general revised target of 2% (it was originally 3% when we started the year), which is going to be hard to achieve. The market might not care now, but if sentiment turns, growth numbers are going to be a major concern. The market finally corrected to test the Trend Average after putting in another intraday all time high early in the morning. 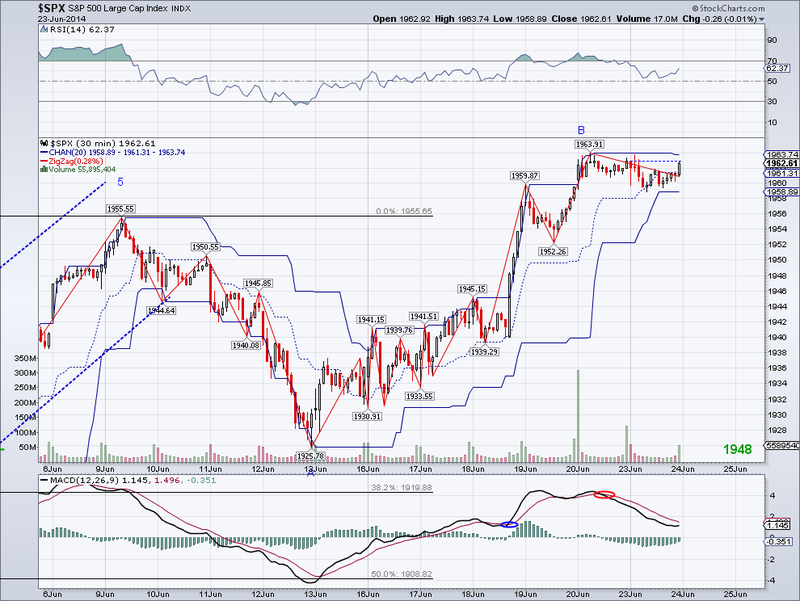 Going by the micro count, I see the possibility of 1941 being the target of today's wave before a counter rally. 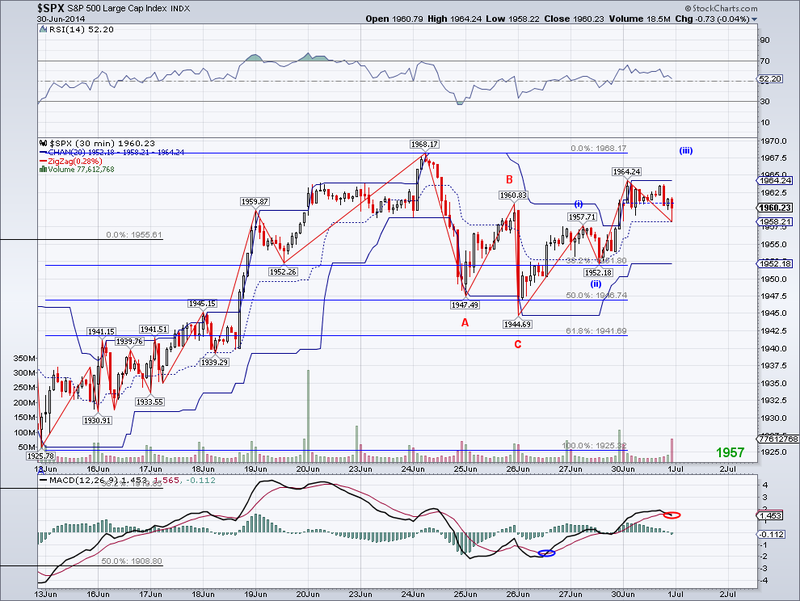 I am not labeling the waves yet but this should be an A or a W1, so there should be more selling after a rebound. Also, the daily MACD wants to roll over again and I see RSI divergence on the daily charts, so perhaps we are seeing a higher degree top? All of a sudden the media has noticed the mess in Iraq. Also, I wouldn't be surprised if Putin makes a move in Ukraine as everyone is more concerned with Iraq. I bought back oil and continue to hold volatility. I will sell volatility depending on how the market handles the TA after a lower low. 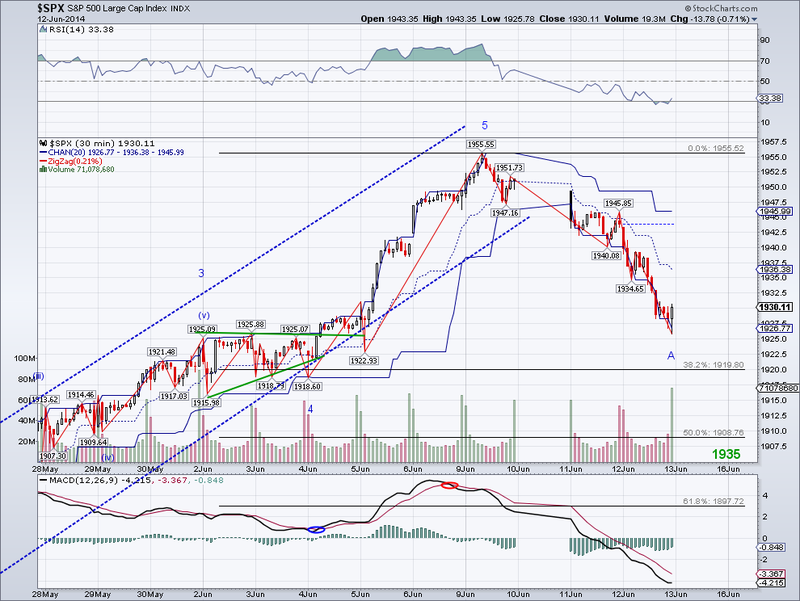 The market took a break today in what seems to be like either a micro W4 consolidation or the start of a correction. Maybe since summer officially started over the weekend, we'll finally see some bears wake up? I don't expect much upside from these levels without a decent correction, so I am still holding to my volatility position. I did however sell oil to position trade, apparently oil has continued to flow despite ISIS capturing one of the largest oil fields. Another position I am considering is long Silver and/or Gold if they test their 50 DMAs, it's a lower risk/high reward set up imo. Another day, another all time high. The bulls just don't want to stop despite the World Cup, summer, lower GDP growth, Russia, Iraq, oil, etc. The question is obviously at what point will reality set in, since the market needs a pullback to stay healthy. The higher it goes without taking breaks, the harder the fall. I am still looking for a test of the Trend Average early next week and so far it is looking like it will be a successful test, so SP 2000 might be just around the corner. I am still holding to VXX which I am still planning to sell on the pullback, and USO which I am not planning to sell anytime soon. 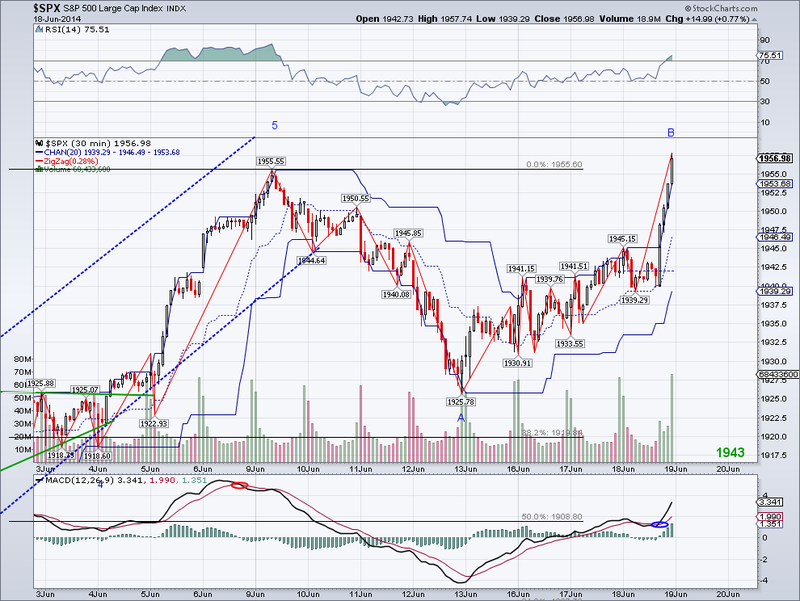 The market ended the day testing yesterday's all time high and we should see the pullback in the next session or two. At this point, bulls the have momentum and could possibly continue to push the rally after a pullback to the Trend Average. Also, I was looking at the NASDAQ and it made a post bubble high today which clears the intermediate term H&S pattern that was formed few weeks ago. In addition, the daily MACD turned back to the bullish side, a rare whipsaw of this indicator. So this summer might just end up different to the past few summers where the market sold off each time. I will sell volatility if the market holds above the TA on a test, no point in fighting the trend. I am sure the market will top sooner rather than later but euphoria is unpredictable and it's better to stock to the TA for bearish trades at this time (as opposed to oscillators and EW). The market made another all time high today after the Yellen spoke. Normally, a rally comes after news like an upward revision of GDP and not a downward revision, but this market simple doesn't care. At this rate, the market might even rally at any hints of a recession! lol. 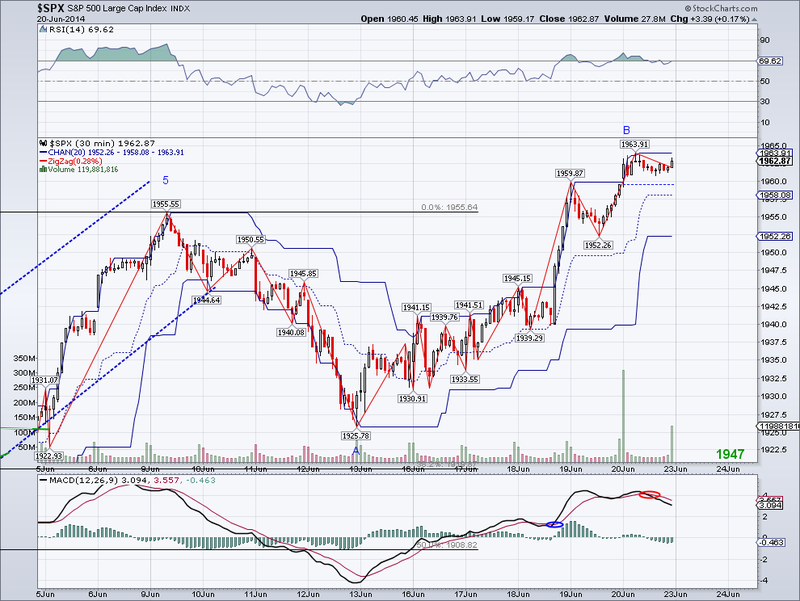 Anyway, the wave I have labeled a B is still in play for an expanded flat. 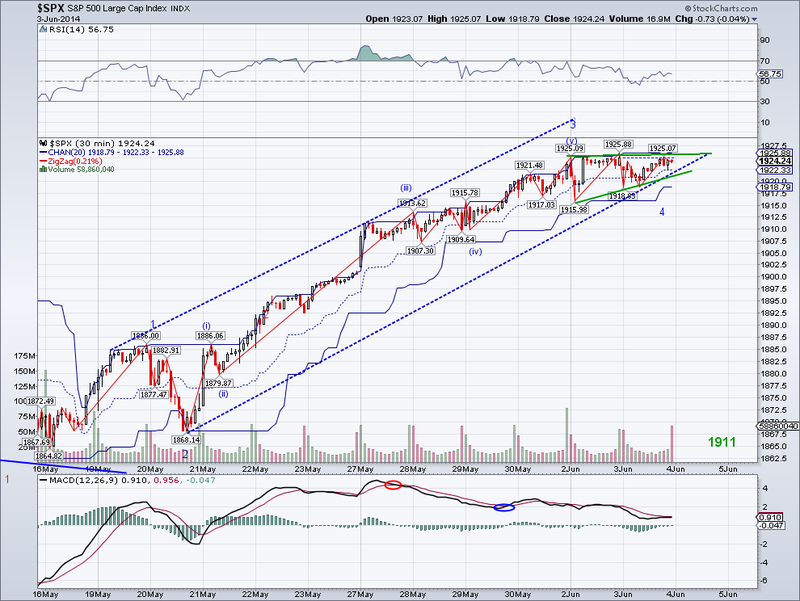 But the market can't go up much further as it would probably turn into a bullish 5 count. The B wave was very choppy up until later in the session today, so we'll have to see what happens tomorrow. Another possibility is a Cup and Handle formation, which would target 1986. I am selling the volatility position at anything less than a substantial sell off in the next session or two and will keep the oil. The market had a bearish open today but was not able to follow through on the bearish count, and instead it moved up and made a higher high for the counter rally wave from 1925. Still, the bounce has been choppy and obviously looks corrective, so I am still expecting another bearish leg that will be a C or a W3. I continue to hold on to my positions as the situation in Iraq might get worse in the next few days. The market bounced early morning as I had been expecting but fell a bit short of the target I had for a ZZ. 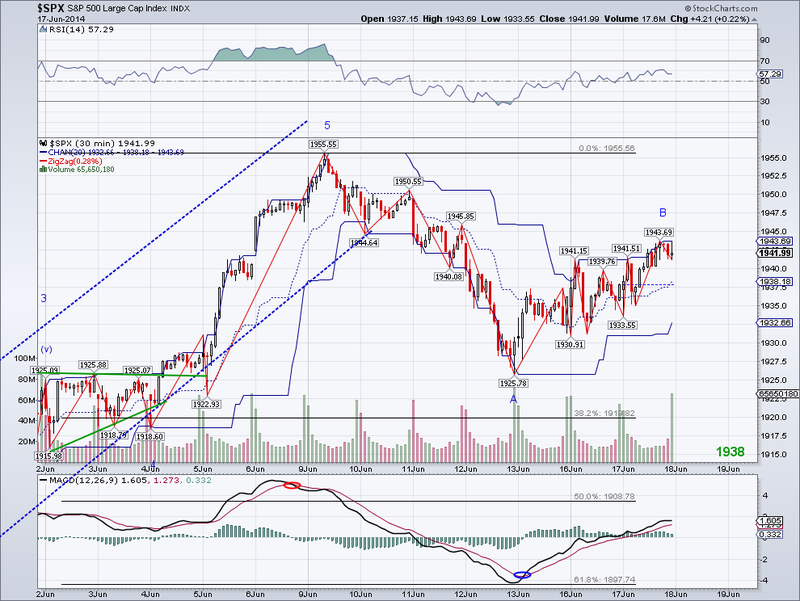 Still, the count suggest a ZZ and a possible bearish 5 wave count from 1941. 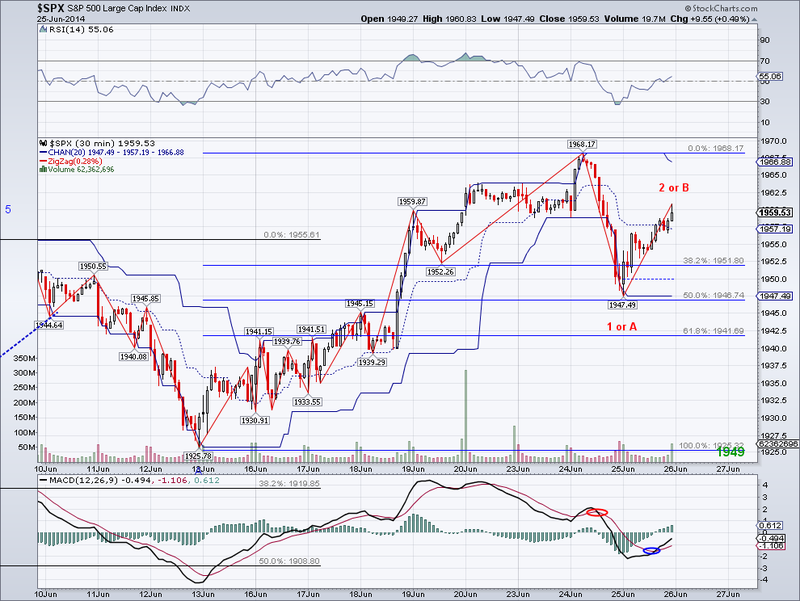 If the micro wave I have labeled W1 is correct, then a 5 count will take the market to the 1918 support level. What happens then will the big question as the geo-political situation is not getting any better. Also, I just read GDP might be revised next week due to weaker than expected health care spending on Q1, with contraction targets of -1.5-2.4%. If that those numbers are correct, we will have another low growth GDP for 2014 of around 2%. Lastly, there's a daily bearish cross on the MACD and that generally means the 50 Day MA (currently at 1889) will be tested at the very least. I am keeping oil and bought back volatility based on the micro count. 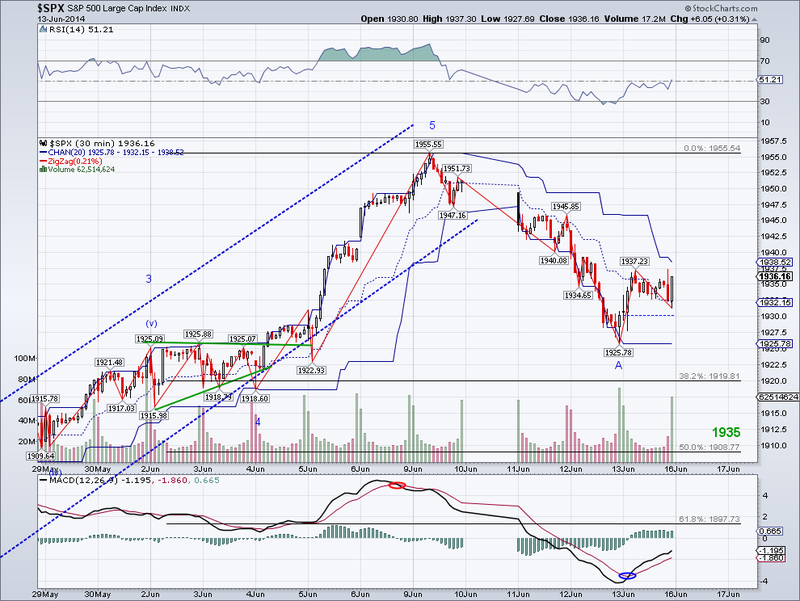 If I am wrong on the count, I will keep position trading volatility. 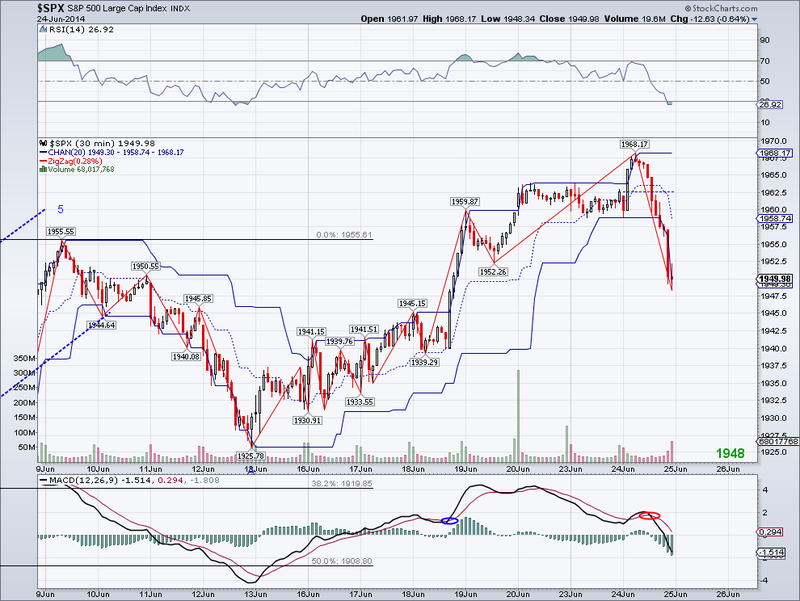 The market bounced as I had expected and if this we get a zig zag then we could see 1945 on Monday. 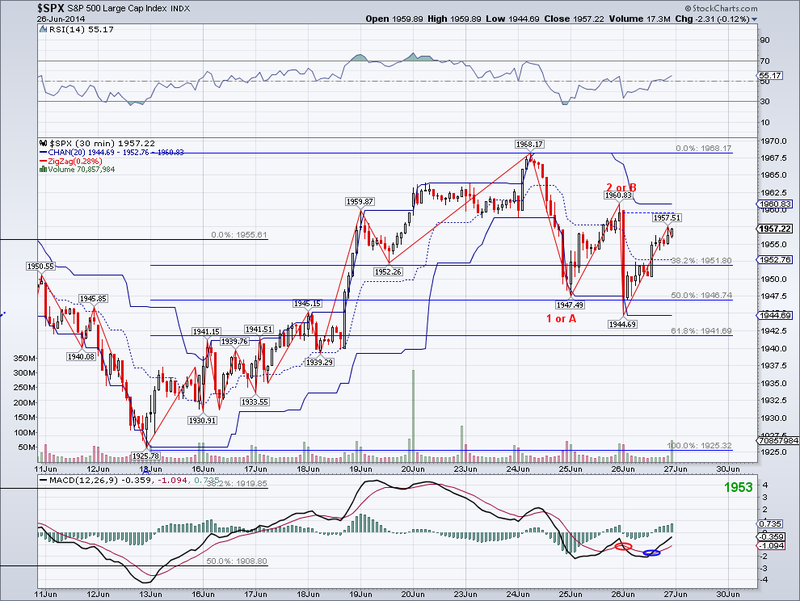 But if the market rallies hard on a bullish W3 then I have 1960 as a target based on the micro count. However, given the situation in Iraq, anything could happen as traders are taking the situation seriously. The latest I read was the ISIS making a push towards Baghdad and now Iran sending fighters to help Iraq, so this could get messy in the next few weeks. The uncertainty of this situation and a continued spike in oil should cause a real correction in the stock market. I am keeping my oil positions and will consider buying back volatility if the market is able to bounce on Monday. The market sold off today and finally came back down to the Trend Average. 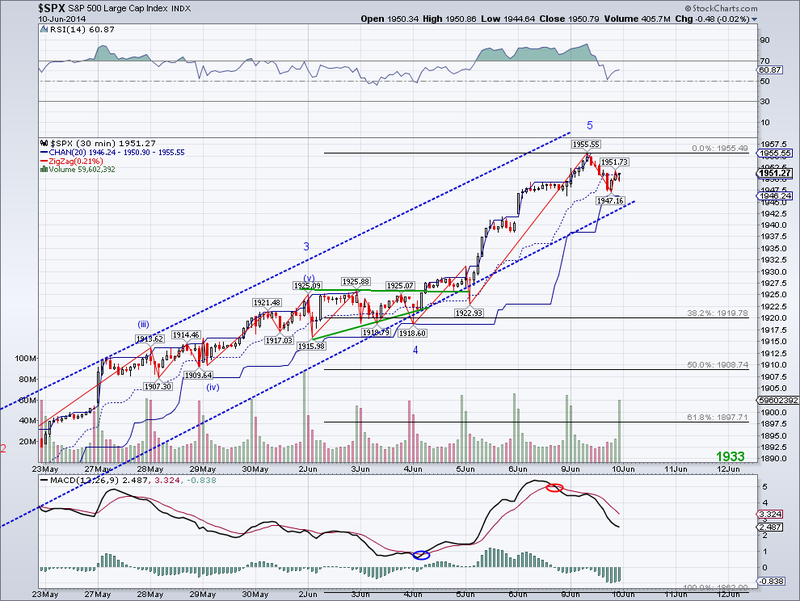 For now, I am assuming this is an A wave and the market will be able to consolidate and rally again. 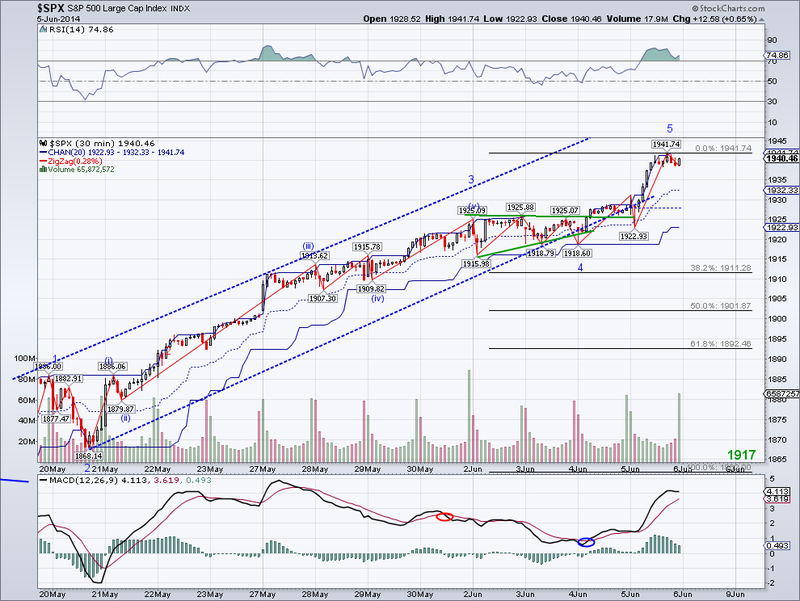 However, if the market loses the TA then I will start entertaining downside targets. The market has a good excuse to sell now as oil is rallying, so what happens in Iraq and oil prices will probably be the main focus in the next few weeks. The interesting thing about oil is that I had been tracking an Ascending Triangle pattern for the past few weeks, with today being the break out of the triangle. In fact, it is the only asset I recommended to go long on the http://ewaveanalytics.com website since I started writing for it. So while Iraq is a legitimate excuse for an oil spike, the bullish pattern was there for quite some time. I just failed to think of an oil rally as the excuse for a market sell off. Unfortunately, my money was tied at that particular time but I bought USO today on the break out. What I didn't make on shorts (since I covered yesterday to position trade), I made on oil and will likely hold until I get a Trend Signal. And fundamentally speaking, the huge mess in Iraq is probably going to get worse as the ISIS, an offshoot of Al Qaeda, is preparing to battle for Baghdad. I can only imagine what a nightmare that will be if Iraq becomes a Caliphate. Ironically, the US supports removing the current Syrian government which is at war with the ISIS. If the Syrian government is toppled, my guess is that ISIS is going to take over too. The war on Iraq was a big mistake from the very beginning. It was a mistake going in, and it was a bigger mistake leaving the Iraqi government to fend for itself. The ISIS is going to make Saddam Hussein look like Gandhi. Now, on a lighter note. Here is my prediction for the World Cup which I'm planning to watch for the next few weeks and which might delay my updates. The question for me is not so much who is going to win the WC but who is going to be in the finals against Brazil. The ideal will be Argentina vs Brazil in the finals (I have to check if Argentina falls in the opposing group), so basically an all South American final. I saw Brazil play today and I am sure Neymar and Oscar will be well known names by the end of the WC. What remains to be seen is how Messi plays this time in the Argentinean squad. The market made another low to continue its correction from the 1955 peak, but I am getting the feeling the market is going to attempt another rally to another all time high before making a Fib correction. Maybe traders want to push it as high as 2000 before taking a summer break? I've always called for a Int Long Term W3 but I never imagined the market could go this high without much of a break since the rally started in Jan 2013. I covered my shorts to position trade, so hopefully we'll get a more predictable pattern like an H&S in the next few sessions. If you look at the chart, you can see the only time the market capitalization to GDP has ever been this high since 1950 was during the 2000 bubble. In comparison, the second largest economy in the world (China - which is growing at 2/3X as fast as the US), has a market cap of 33% of GDP vs 127% of GDP for the US. So while the market can continue to go higher and match the 2000 bubble peak on this indicator, it is inevitable this ratio will go back to its historical mean.. when will that happen is obviously the million dollar question. 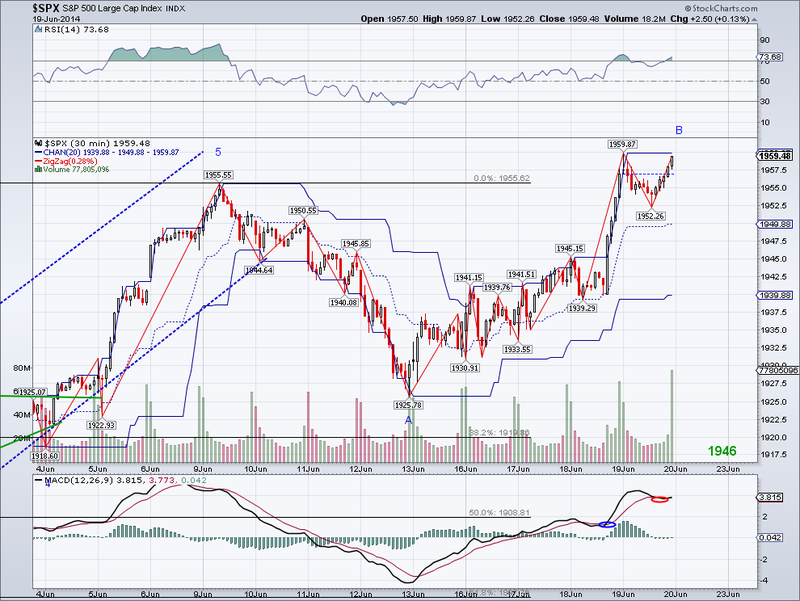 The market made it to the micro-count target and this could be a potential top. 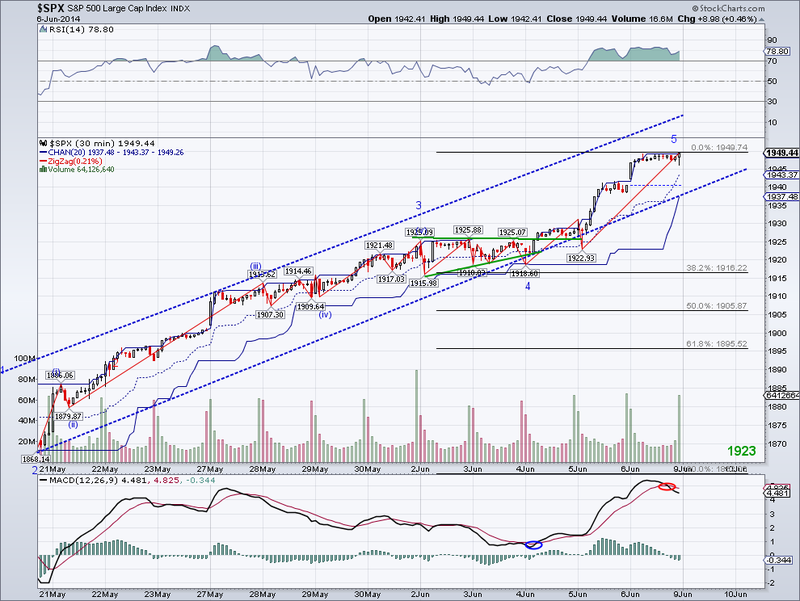 I think there are enough waves to call a correction to the Trend Average. There is the possibility of a small H&S formation with today's low (1947) marking the neckline, so we'll see tomorrow if a lower low is made or if we get a rally to form the Head of the H&S. I hope the market will finally start a decent correction, specially since I am short now. There's a common notion that the market is able to price assets in advance but I think it has gotten ahead of itself at this point. IMO, the shorter term market is ruled by speculators who tend to miss-price assets more often than not, so it's not as "smart" as some people think it is. People who have made the most money are the ones who have been able to identify the "true" value of assets and acted during market extremes. Most of you guys remember a few weeks ago I was day trading a pharma stock trying to catch some pennies here and there. To my shock, this pharma stock which I bought and sold in lots of 10,000 shares at $5 less than a month ago, was bought out today by Merck for $24.50.. Had Merck decided to make the announcement when I had these shares on hand just few weeks ago, I would have made $200,000 overnight! Argghh.. so my point is, had the market been "smart", this stock would not have traded so far below the value that it was assigned today, which I am sure is close to its intrinsic value since it is being bought out by Merck and not some Facebook like company. So should the S&P500 be at 1,950 today? probably not (as I think it's overbought and overvalued) and some day it might just go back to its true value, I just hope we're lucky enough to make money from it. The micro count turned out to be correct and I'm assuming the target (1953) will be met in pre-market over the weekend or on Monday's session. The market has rallied hard in the past few sessions, however it is still within the Ending Diagonal scenario, so the probability for a sudden big drop is there. But if the market can keep rallying without pulling back past 1970, then it will mean the pattern has failed. It's hard to imagine this market going up without pulling back, but when euphoria takes over, there's simply no stopping it. I am keeping my positions as I expect a pullback starting early next week but I will cover (and take profit hopefully) if the market manages to trade above the Trend Average. The market rallied past 1930 and it reached its original Ascending Triangle target as well as the 1939 "ideal" level to call the structure from 1862 complete. 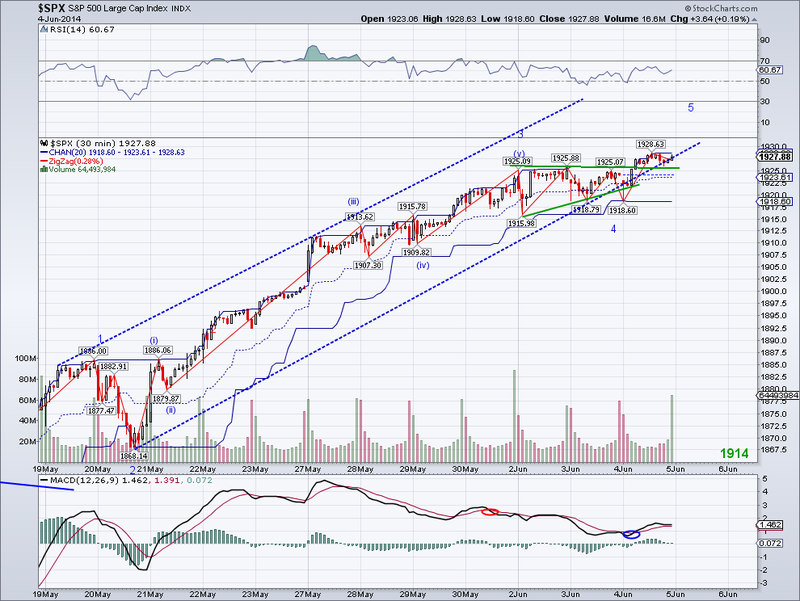 I do see a potential for 1953 going by the micro count but I think the market is ready for a pullback. It will be interesting to see if 1902 holds on the correction, if that level fails then the 50 DMA will be again tested and we will see if this market intends to go for 2000 this summer. The European Central Bank's negative interest policy favors assets in general, so maybe this will be the excuse for a crazy summer rally. I bought back the rest of my short position I sold when 1902 first broke so now I am back to all short in my short term trading account. 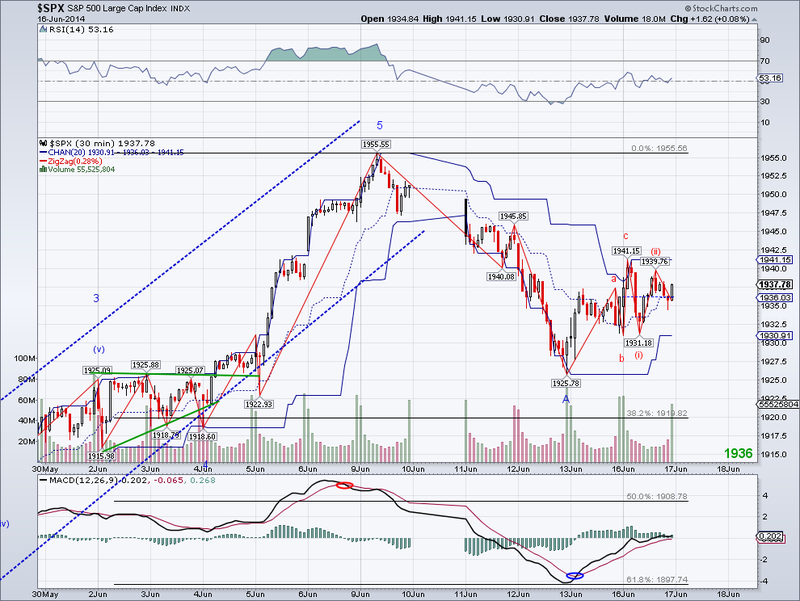 The market broke out of its Ascending Triangle pattern early morning, but so far it is lacking momentum. If the market fails to rally over 1930 tomorrow, there's a chance the final leg is in and we will see a bigger correction coming. I noticed I made an error in calculating the length of W5 that I posted yesterday. The W1 is actually 24 points and not 18, so an "ideal" target would be 1915+24= 1939. But given the fact W3 extended past the original target for this wave, the slightly higher high today would satisfy a 5 wave count from 1862. I am still holding the same VXX position from last week but haven't added the other portion since we might get to the 1930's. I think we finally have something that looks like a "proper" W4 after today's price action. We now have an Ascending Triangle pattern with a target of 1935, which would imply a W5 that is 20 points in length and in line with the proportion to W1 I posted about yesterday. So if the pattern materializes, we should see a rally starting tomorrow and perhaps we'll finally get a decent correction. Whether or not is "the correction", it's impossible to tell. Also, I wanted point something about the monthly chart I posted yesterday. Prior to the 2002 sell off, we had the peak in the markets in 2000 which doesn't show on the charts. And from the 1995-2000 period, the markets had a diverging 70+ monthly RSI that lasted 5 years, so it is fair to say that while the extreme overbought RSI on a monthly time frame have been great predictors in the last 12 years. The period from 1995-2000 was not a good example of this particular signal being a good indicator on its own. However, the key to this system working is the "turn of the trend", and by that I meant a death crossover or the 50/200. At this point, we are obviously far from it but it is good to keep it in mind given the fact of what has happened in the last 12 years. Also, I think the 1995-2000 period was a unique period in the history of humankind as the internet gained mass acceptance in the world during this period. This is a time that will be remembered several hundred years from now, as it is as important as the introduction of the printing press in Europe (which led to the Renaissance and consequently the Industrial Revolution). So the bottom line is, the markets might continue to rally past 2000 but it will need to stop sooner rather than later to consolidate all the gains from the last few years. The market reached the 1925 target today after pulling back to the 1915 level. Technically, I could label 1915 a W4 and the wave to the high today a W5, but I have my doubts about the entire structure being finished already. I think it would look better if we have a better looking W4 and then a W5 that is proportionate to W1, which was 18 points. But whatever it is, a substantial pullback should be coming sooner rather than later. 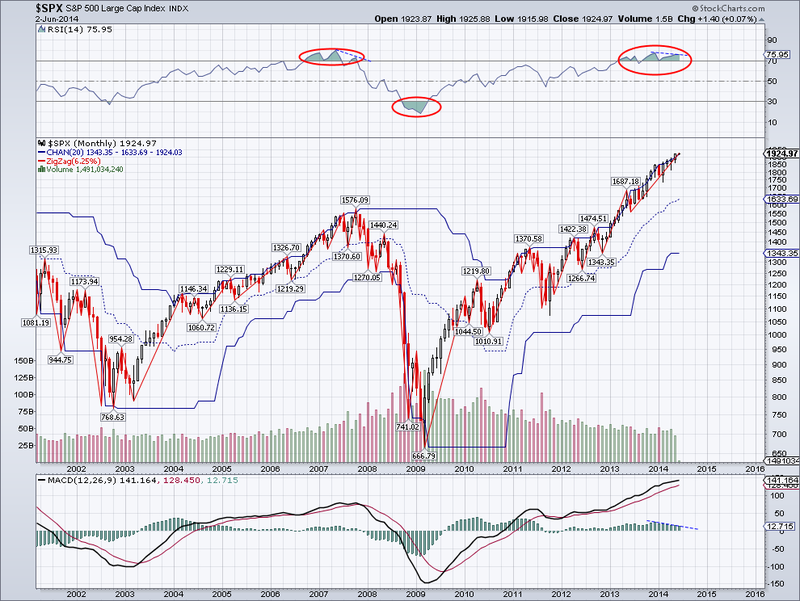 And to illustrate where we are in the long term charts, I posted the SP500 on a monthly time frame. Note where the RSI is and what has happened every time the monthly RSI has gone into an extreme. So while the market could go up some more, the risk/reward does not favor being long in the long term. If a person pulled out of the market at the first turn of the trend during the RSI overbought extremes and bought at the oversold extremes in the last 12 years, he would have 600% return without even going short. I would call this the most simple way to make money long term in the markets, not much thinking needed using this particular system. Another interesting fact this month is that this is the 64th month of the bull market. This monthly number has coincided several times with significant peaks in the past, most notably the Dow in the 1920s, Nikkei in the late 80's, Nasdaq 2000 and couple of others than fell in the 60th and 65th. Obviously, this is just numerology and it could all just be coincidence. But there's no denying the monthly chart I posted favors a big pullback in the next few weeks. I continue to hold the VXX from last week but did not add to short position despite 1925 being hit. I think I rather see a trend change first before adding to shorts. As of now, all trends are bullish and the best is obviously not to short blindly.